Not every stock was a loser last year. Investors have been rattled by the recent stock market slide, but for much of 2018 they were cheering. Stocks moved steadily higher over the first nine months of the year, propelled by low unemployment, strong consumer spending, and the corporate tax cut, with The S&P 500 hitting an all-time closing high on Sept. 20 at 2,930 and the Nasdaq up more than 16% at one point. While all major indexes finished in the red for the year and stocks generally pulled back in the fourth quarter, there were still a number of big winners that were able to book enough gains in the early part of the year to finish 2018 up more than double from a year ago. Three of these stocks, The Trade Desk (NASDAQ:TTD), Okta (NASDAQ:OKTA), and Etsy (NASDAQ:ETSY), look poised for further gains. Let's take a closer look at what to expect from this bunch below. Few companies delivered the combination of growth and profitability that The Trade Desk did in 2018. With revenue up 54% through the first three quarters to $316.8 million and non-GAAP net income surging 58% to $72.7 million, equaling a profit margin of 23%, it's easy to see why Trade Desk stock jumped 154% last year. That growth opportunity should continue, as the digital ad market is exploding -- it likely topped $100 billion globally in 2018 after increasing 21% in 2017 to $88 billion. The Trade Desk helps companies with programmatic advertising using a cloud-based platform that allows ad buyers to create, manage, and optimize data-driven ad campaigns, and is a leader in its industry. The Trade Desk's clients are mostly large advertising agencies, and as digital advertising takes over traditional forms of advertising like print, TV, and outdoor that are less efficient and data-driven, the company should continue to put up strong growth. At a reasonable forward P/E ratio of 42, the stock could have more growth ahead of it this year, especially if the consumer economy remains strong and it benefits from Amazon's big push into advertising. Check out the latest Okta earnings call transcript. Another big winner last year was Okta, a leading provider of cloud-based identity and security tools. Okta helps enterprises protect websites, databases, and other proprietary information with tools like password protection and two-factor authentication, and its adaptable cloud service allows a range of companies to customize its software for their own needs. As a neutral platform, Okta has attracted a wide range of customers and found strong growth last year, consistently topping its own estimates. Revenue through the first three quarters of the year is up 58% to $283.8 million, and the company is taking steps toward profitability, reaching positive free cash flow in the third quarter. Okta has moderated sales and marketing expenses recently, which helped narrow its operating loss from $34.5 million to $28.5 million despite much higher revenue. On a non-GAAP basis, its net loss narrowed from $17.9 million to $3.9 million. Okta has also seen strong growth in customers with annual recurring revenue of $100,000 or more, showing that it is successfully adding new customers and expanding those relationships. Over time, these relationships add to Okta's competitive advantage because integration with Okta's system makes it more difficult for customers to switch away from the platform, having already invested time, money, and effort into learning how to use Okta's tools. 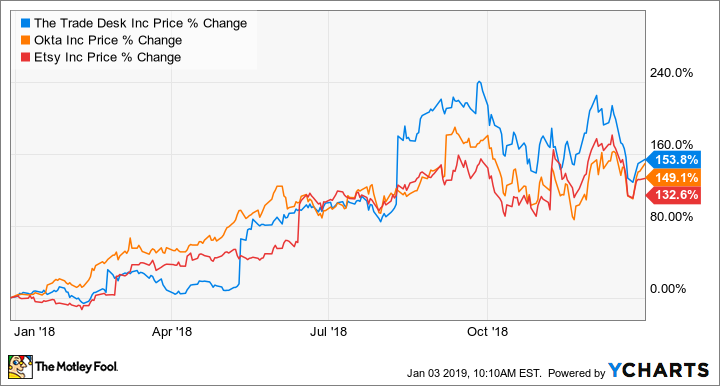 As more companies move their security needs to the cloud, Okta sees a long tail of growth ahead, and said at its October Investor Day conference that it was targeting revenue growth of at least 30% over each of the next five years. Though the stock is expensive at a price-to-sales ratio of 19, profits should eventually come as sales and marketing expenses moderate. If growth continues to top expectations, the stock should move higher again this year. After struggling in the years following its IPO, online arts-and-crafts seller Etsy has finally found its legs with the help of new management. The stock jumped 132% last year and is up more than 300% since May 2017, shortly before activist investors took a stake in the company and Josh Silverman was named CEO. Silverman laid off employees and cut costs, moving the focus of the company away from its corporate workforce and to its buyers and sellers, placing a priority on growing gross merchandise sales (GMS). In the third quarter, Etsy said currency-neutral GMS increased 20.8%, accelerating from 19.3% in the second quarter and hitting $922.5 million, which drove revenue up 41.3% to $150.4 million with the help of a new pricing structure. Back-end improvements like a migration to the cloud and enhancing the user experience with a better landing-page experience and improved search algorithms to help shoppers find fast shipping times were also key, and pushed adjusted EBITDA up 95% in the first three quarters of the year to $88.2 million. Having resisted a challenge from Amazon in the form of Amazon Handmade, Etsy essentially has the online crafts space to itself, giving it a competitive advantage through its brand reputation and network effects, which should help it deliver strong profit margins -- especially as the marketplace model is one of the best ways to generate e-commerce profits. With the broader retail industry reporting strong holiday sales, Etsy was likely a winner in the fourth quarter too. The stock could surge if the company delivers another round of strong results when its next earnings report comes out in February.